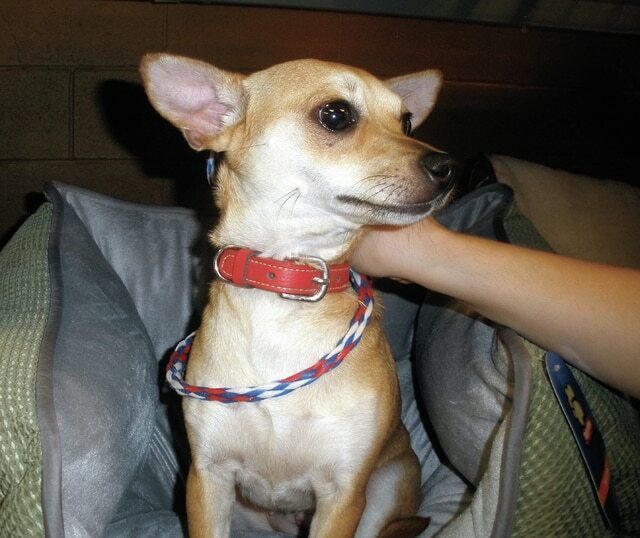 Born approximately May 15, 2014, Apple is a spayed, female, Chihuahua dog. Not a great deal is known about Apple, as she was found wandering up and down the highway, and was rescued by a kind person who was afraid she would be hit by a car. But this much has been reported by her foster parent. Apple has a great personality and disposition, and will warm to you quickly if shown a little love. She gets along well with other dogs her own size, and would love to have another small playmate. Apple loves to play! But, if you are looking for a “lap-dog,” Apple has no problem filling that space as well. That said: a fenced in yard is a must for her as she loves to run, play, and explore her surroundings.